The book of Judges marks an important transition in the life of Israel. It shows the cycle of deviancy and repentance, heroic actions and social collapse, the misuse of power and the marginalization of God. This commentary seeks to help readers navigate the many strange stories and characters of Judges by providing an overall framework for reading it and by explaining a way of entering its stories so that that they can be appropriated in an Asian context. This commentary challenges the reader to pray and work for a spiritual revitalization, building a new social fabric in a world marked by injustice, pragmatism, and the loss of a God-centered way of life. 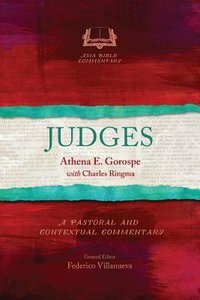 About "Judges (Asia Bible Commentary Series)"
Ringma (Ph.D., University of Queensland) is professor of misRingma (Ph.D., University of Queensland) is professor of missions and evangelism at Regent College in Vancouver, Britishsions and evangelism at Regent College in Vancouver, British Columbia. Columbia.